These are the Sisters Mercurio circa 1940 something, Mom (with the Mink) would be able to figure it out.Only she and Aunt Theresa, standing right behind Mom, are still alive. 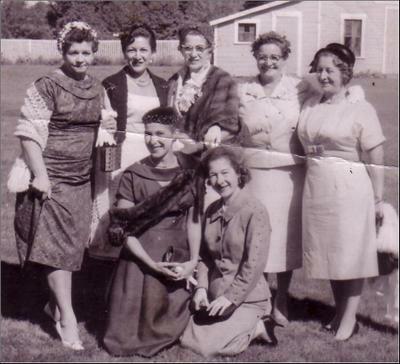 My Aunt, Ellie Mercurio DiFiore, the imp kneeling on the right in the foreground, passed away in her sleep yesterday at the age of 83. We shared a birthday and the dogged frugality that led me to quilting in the first place. It was Ellie who taught me to thread and run her factory model Singer and gave me free run of her sewing room when I was only 7 years old. Anything went as long as I didn't use her good scissors or sew my fingers together. I can't remember making anything useful but I do remember loving how neato different fabrics looked seamed together and pressed flat in her steam press. Mom is in poor health now and cursed me out long distance for getting my siblings and Father to scour her room for hidden cigarettes and dispose of them while she was in the hospital. It's hard to be a good daughter from 800 miles away. I am sorry to hear about your loss. I had a great grandmother like your aunt. She gave me all of her scrap fabric (although I managed to cut up a skirt in progress once) and let me use her extra pair of "big" scissors. I'm sorry about Aunt Ellie Mercurio DiFiore. What a wonderful picture of the sisters. Looks like you come from good stock. I'm so sorry to hear about your Aunt, but I, personally, think that you sound like a *terrific* daughter at ANY distance!